An African safari has been on my wish list for the longest time, but we finally made it! In our two week sojourn in South Africa, our first stop was at Tswalu Kalahari. It is a more unconventional choice for the first time safari goer - most people recommend the Kruger for the big five before appreciating the varied desert-adapted species that call Tswalu home - but I have absolutely no regrets about the way our itinerary unfolded. 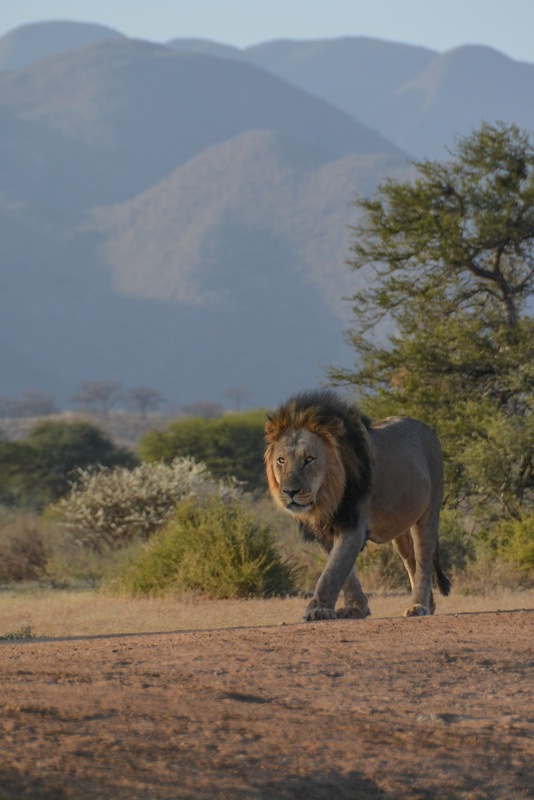 Tswalu is the largest private game reserve in South Africa, spanning over 1,000 square kilometres, and is owned by the Oppenheimer family (yes, the same name in diamonds). What is interesting about the property is its conservation story: having been rehabilitated from agricultural farm land over the last two decades, it was formally declared a Nature Reserve by the government in 2014. Despite the vast acreage of the property, the accommodation is intimate with a maximum capacity of 28 adults at any one time. There are two types of accommodation: the Motse and the Tarkuni. Each Motse (there are nine of them) accommodates two adults in a villa made of desert sand, rock and thatch and the Tarkuni is a large family house (originally designed as the Oppenheimer's family home) with five rooms which can sleep ten adults. The Motse was spacious and airy, equipped with air-conditioning and a wood-burning fireplace (which was great when it got chilly in the evenings). We arrive at Tswalu at 2.00pm, and have just over an hour to refresh and get ready for our first afternoon drive. At check-in, we are given a species checklist and our butler jokingly tells us that completing it daily is our homework. Our adrenaline is pumping and we can't wait to get out there. The landscape is surprisingly beautiful with gorgeous red earth and stunning blue skies. We set out on the road and it isn't long before we see a giraffe - the first animal to greet us in Africa and he is beautiful. Mike sets us at ease immediately and his passion for the natural world is infectious. We see a yellow hornbill (Zazu from the Lion King), some oryx, a couple of warthogs (aka Poomba), a family of meerkat in the distance, a male ostrich darting across the grasslands, a journey of giraffe grazing on the tree branches, roan antelope and eland, before we hear a crackle over the radio that a pangolin has been spotted. Mike drives us quickly to the area and we get off the jeep to catch the animal on foot. The hubby and I are slightly nervous being out in the open but we follow Mike's lead and are rewarded with an amazing viewing of the pangolin foraging about in the late afternoon. The hubby gets up close and personal with his Go Pro as the pangolin starts moving towards him. It's a great start to our safari and as we watch the sun go down in brilliant African style, we can't wait for first light tomorrow. We are up at the crack of dawn and for the first time in my life I'm excited to be awake so early in the morning. After a coffee and muffin in the reception room, we are revving to go. Jonas tells us we are tracking cheetah this morning. He points out a cheetah paw print in the sand and Mike drives us onward. It isn't long before we see two cheetah walking down the road. We are told they are brothers. Mike points out the fence line of the reserve and tells us hopefully it won't be long before they can be taken down and the reserve opened. We follow the cheetah brothers down the road until they come to rest in shade beneath the bushes. We drive past some zebra, tsessebe and oryx on our return to the lodge for a proper breakfast and then the hubby goes for a massage at the spa. I take advantage of the time to write postcards to my niece and nephew, my parents and siblings, and my parents-in-law. The postcards and postage are complimentary at Tswalu - a lovely touch. While I sit at the desk writing, a sable antelope and a couple of nyala appear right outside the picture window, much to my delight! Then it's my turn for a massage before we lounge by the pool for lunch. Although there are menus, the chef is happy to cater for special requests, and the hubby decides that he wants a customized pasta. Slightly more adventurous, I eat kudu loin schnitzel. It's gamey as expected, but at least I can say I've tried it! Having rested and indulged, we are ready for our afternoon game drive. Jonas and Mike think it's a good time to track lions, so off we go. We see some zebra on the way, guinea fowl and more antelope (including a kudu - who I whisper an apology to given my lunch) but then it's just us and the landscape for a while. Under Jonas' guidance, we keep travelling for the next two hours. The hubby and I start to give up hope as the afternoon sun starts to fall. After what feels like an eternity, and thanks to Jonas' expertise, we finally locate the pride of lions. We can see their bellies are full and they are completely unfazed by our presence. The light is amazing and we snap photographs to our hearts' content. The thrill of deciding to track a particular animal and then to actually find it - it was incredible. The cherry on top is the gorgeous sunset view before we head back to the lodge. On our way, we see a wild cheetah and Mike takes us to the sanctuary where the reserve is holding the surviving wild dogs. Wild dogs are amazing predators, with an 80% success rate when they hunt. Sadly, the pack of eighteen who used to roam Tswalu were hit with distemper and all but three were killed. The reserve is planning to re-locate some wild dogs from elsewhere to be reintroduced to Tswalu. This just means we'll have to visit again! After our eventful day of tracking cats, we enjoy an alfresco dinner before heading back to the room. A warm fire greets us and that's a wrap for the day. This morning we are graced with a slightly later start - we're going to see the meerkats (who, like me, enjoy a sleep in). The documentary "Meerkat Manor" was filmed not too far from here, and Tswalu is one of the best places to view them, with two habituated colonies. Mike describes how the meerkats love warmth on a chilly winter morning, and will face their bellies towards the sun as it makes its way up across the sky. It's a cloudy morning, so the meerkat scouts dart out of the burrows and then back in - waiting for the sun before calling the troops out. Eventually, the sun appears and the meerkat family quickly disperses across the sand, foraging for food. One meerkat stands sentry atop a tree, on the look out for danger. It's a joyful sight and one of the reasons I was so keen to come to this reserve. The hubby plays with the Go Pro and with Mike's help, we see the curious meerkats interacting with the camera. After such a fabulous start to the day, we jet off for a long drive to our breakfast spot. Rather than heading back to the lodge for breakfast, Mike and Jonas have planned a picnic next to a watering hole in the hope of seeing a rhino come to drink. Jonas tells us this is his favourite place in the reserve, where he has seen numerous black rhinos. It feels like we are having a picnic on the beach - and the day is warming up fast. No rhinos today - I think our jeep may have spooked a few would-be drinkers, including some thirsty warthogs who were too afraid to venture towards the water with us there. It's back to the lodge where we have a couple of hours' rest by the swimming pool, before getting ready for our afternoon horseback safari. We make our way to the stables and get geared up for the horses. Mike and Jonas will track the elusive black rhinos we didn't get to see in the morning, and will radio their location to our horse-riding guide, Patrick. We set off on horseback, and I'm too nervous to use the iPhone to snap any good pics for fear of dropping it (I'm a clutz), so this is one where I have to just enjoy the moment. After the ride, we are reunited with the jeep and after some snacks and drinks, we make our way towards the black rhino. We learn about how the white and black rhino were named, their differences and their diet (Mike even picks up some rhino poop to show us). "White" in white rhino is said to be an error in translation of the Afrikaans word "wide", referring to the wide squarish jaw of the white rhino, as distinct from the more pointed lip of the black rhino. Since they already named the white rhino as such, when this other species of rhino was discovered, it is said people simply referred to it as "black" (it's actually brown/grey in colour). The surrounding bushes are so picturesque and the light so soft that the rhino looks magical, almost like a unicorn. As we journey back to the lodge for our final night at Tswalu, we feel lucky to have been able to witness such a magnificent creature, and feel sad that it is so critically endangered. A boma dinner awaits us and the food is the highlight of our stay. The hubby and I are fans of South African barbecue or "braai" (the lamb was so succulent and tender) and the traditional South African baked dessert of malva pudding was to die for. When we reach our room, we see that we have been given two small bottles containing the distinctly red Tswalu sand, as a keepsake of our time here. We'd packed the night before to squeeze in a final morning game drive before heading straight to the airport. I can't get enough of how gorgeous the landscape is and while my eyes try to soak everything in, my heart feels heavy - I am sad to have to say goodbye. Before long, we find two male Kalahari lions, with their unmistakable black manes. Nearby is a lioness, and we watch as she decides to take a drink by the water. Mike points out the red hues on the lioness' fur - she has eaten recently. The lioness then calls out - the sound is gruff, low and harsh - and other lionesses emerge from behind some bushes to join her at the water. 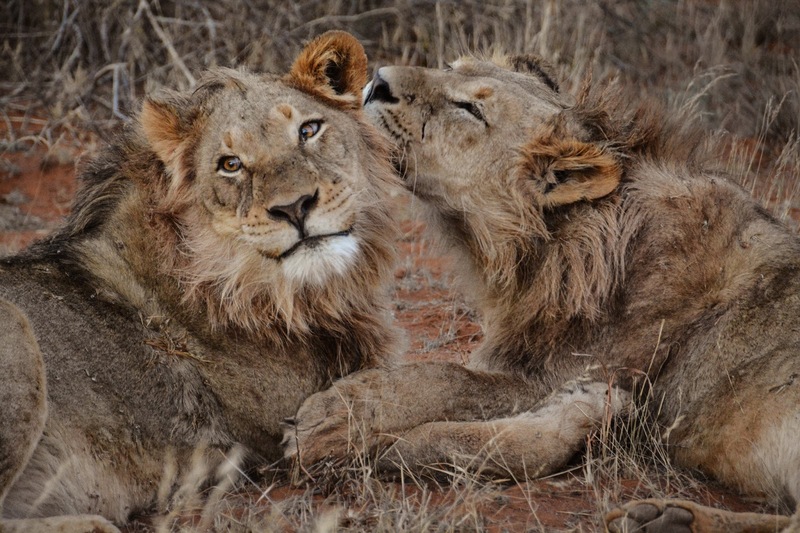 More calls, and the male lions begin making their way towards the females. It's a group outing at the watering hole. Mike drives us over to where the other lions emerged, and we find the mostly eaten carcass of an oryx. We drive back to continue watching near the water. We watch the scene unravel from the jeep, mesmerized. It's probably the longest interaction we've seen from any animals on our safari so far, and I can't think of a better way to finish at Tswalu. Our time at Tswalu was absolutely unforgettable and the hubby and I are already talking about coming back (even though this was meant to be a once in a lifetime kind of holiday!). I can't speak more highly of our tracker, Jonas and our guide, Mike (check out his photography here). Having been spoiled at Tswalu with such warm, genuine, down-to-earth staff, great wildlife viewing and such pretty vistas, Tswalu has set a high bar for the rest of our journey in Africa. Thanks Charlie Rob! We had a great time, and I'm glad you enjoyed reading the post. Lovely pictures !! Yesterday we book five days in Tswalu :D Cant wait to see the Kalahari.